This would’ve been much easier if White Castle served crepes. 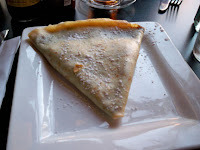 The one thing Kelly really wanted to get on this trip was crepes, and out of all the creperies we could find online, Rooster definitely seemed the most intriguing. 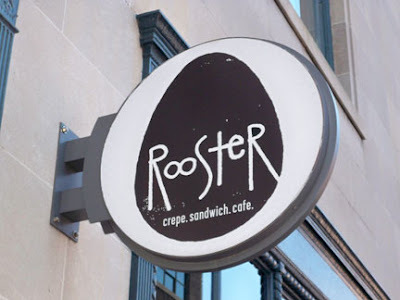 It looked to be a hip little place downtown, and quite frankly, the websites for the other creperies were kind of sad and Rooster had a pretty cool logo. Decision made. 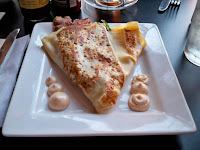 Looking over the menu, I thought real hard about the savory brie crepe with roasted spiced apples, but ultimately went with the G.B.L.T. ($7.95) It’s filled with goat cheese, bacon, romaine lettuce and tomato -- and come on, you can’t go wrong with goat cheese and bacon. While typing this, I actually just remembered what G.B.L.T. usually stands for. Wonder if that’s intentional. Kelly got hers with Nutella and strawberries ($6.95), and when our crepes arrived, we had to stop and admire them for a minute. They were so artfully constructed, we almost felt bad cutting into them. Almost. When we finally did take and trade bites of each, we agreed they were both outstanding. Just look at that bacon peeking out the end of mine. And while I’m sure the following is true of Kansas City and other cities during the weekend, the streets of downtown St. Louis this morning were eerily quiet and deserted. It was like the daytime scenes in "I Am Legend." Creepy. I’d probably risk death by vampire for the chance to try that brie crepe, though. 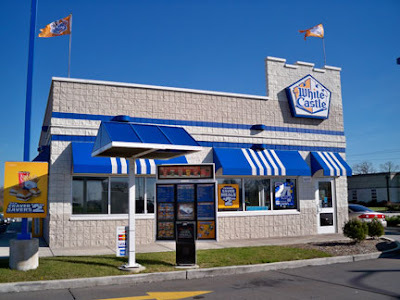 After a trip to Trader Joe’s, it was finally FINALLY time to go to White Castle. How I made it 36 hours in St. Louis without going to White Castle, I’ll never know. So we hopped on the highway, figuring for sure we’d stumble across one. We drove and drove, and I was starting to get seriously nervous. Eventually we stopped for directions at a gas station. While the people working there were no help, lucky for me a guy buying one of the biggest sodas I’ve ever seen was able to tell us how to get to not just one but the three closest White Castles. Kelly did it wrong and got a couple of chicken sandwiches. Whatever. At Krystal, sure -- especially if the Spicy Chik is an option -- but when it comes to White Castle, it’s all about Sliders and Sliders only. Of course, right after we got back on the highway, we passed like three more White Castles. Kelly was adamantly opposed to stopping for round two, though. Good thing a return trip to St. Louis may soon be warranted. For one thing, The Bangles are playing at The Pageant on May 2, right across the street from Pi Pizzeria. Different Light has been one of my favorite records ever since sixth grade. I know -- T-U-F-F, right? Another reason is that we picked up some Trader Joe’s Cinnamon Schoolbook Cookies that are shaped like letters for the kiddo, and she’s big into them. So big into them that I’m a little nervous about the fury she might unleash when we run out. Yes, we’re going to need to go back. Forty-five minute wait? No problem! We’ll just have a seat at the bar. To be honest, I’d be a little disappointed and a lot suspicious if we were able to get a table right away. Besides, the wait is a big part of the whole Italian restaurant experience for me -- talking to the bartender, people watching and all that. And I’m glad to say that we had a great time here at Gian-Tony’s Ristorante, even if my entrée turned out to be okay at best. More on that in a minute, though. Sitting at the end of the bar, Kelly and I opened up the wine list to take a look. Seeing as how Gian-Tony’s descriptions were crazy eloquent, I’ll just go ahead and repeat what it said about our selections. Sterling Vintner's Collection Cabernet Sauvignon: "Distinctive aromas of ripe blackberries, pepper, toast and hints of smoked meats are followed by subtle notes of light chocolate mint and vanilla." Villa Rozzi Nero D'Avola: "An intense inky red, the Nero D'Avola seductively reveals a gorgeous perfume of blackberry liqueur, white flowers and a hint of figs delivered in a leather basket." After reading that, one of us was totally obligated to get the Villa Rozzi. It was practically made for us, since Kelly and I so often show up on our friends’ doorsteps bearing leather baskets full of white flowers and figs. It’s kind of our thing. Both the Villa Rozzi and the Sterling Vintner lived up to the hype taste-wise. Then, 45 minutes right on the dot later, we were seated. As mentioned, I didn’t much care for my entrée. 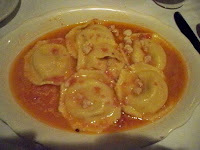 I ordered the Seafood Ravioli ($15.25), which per the menu is “Stuffed with shrimp, crab and clam, finished in a light tomato sauce with white wine, butter, garlic and diced bay scallops.” It’s not like it tasted bad -- it just didn’t taste like anything at all, and the sauce was barely there. 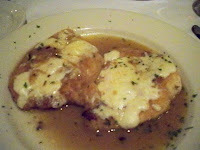 The Polla Alla Romana ($17.50) that Kelly got, however, was ridiculously flavorful. “Breaded with prosciutto ham, broiled, finished in a white wine sauce (with a) touch of sage," it was perfectly cooked with a good crisp and topped with mozzarella. The couple of bites that Kelly gave me more than made up for the Seafood Ravioli. I’d love to try some of Gian-Tony’s other entrees. That said, considering the drastic difference in the two we had tonight, if we went back I’d probably take the safe route and get the Polla Alla Romana again. Gian-Tony’s isn’t outrageously pricey, but it’s pricey enough that I don’t care to risk a game of menu roulette. After dinner, we took a drive around the neighborhood of our hotel to try and find a bar within walking distance to grab a beer. Most of the places looked way too packed or too loud for us to have a conversation, so we ended up at this hole in the wall -- and please know I mean that in the most positive way. Since PBR tallboys were only $2.50, I got us a couple of those. Meanwhile, “Paradise City” came on the jukebox and Dorky Kid Rock’s girlfriend started doing some stripper moves behind him, yet well enough within his peripheral vision that he had to have known what was going on. When Dorky Kid Rock finally acknowledged her after actively ignoring the show for most of the song, I couldn’t tell if he was just disinterested or mildly annoyed. Either way, nobody was acting like this was anything out of the ordinary. A sign behind the bar said, “Try a Cold Gin & Squirt.” If I remember correctly, it was even written on no less than a starburst cut-out. With that kind of fanfare we figured the drink must be a 34 Club specialty, thus Gin & Squirts it was for our next round. Yes, really. We genuinely enjoyed our Gin & Squirts. If they’d been serving up Bourbon & RC, I would’ve been all over that, too. Welcome to my new obsession of mixing well liquor and third-tier sodas. I’m going to have to go ahead and draw the line at anything made with Big Red, though. 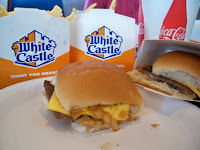 Next Time on Lunch Blog: I'm gonna go nuts if we don't go to White Castle already. Spuds MacKenzie, you are sorely missed. When we started planning our trip to St. Louis, we thought about going to a museum. 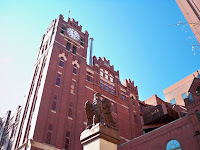 However, we ultimately decided to take a tour of the Anheuser-Busch Brewery instead. It’s kind of like a museum, just all about Anheuser-Busch. Plus, free beer. And free beer usually wins. 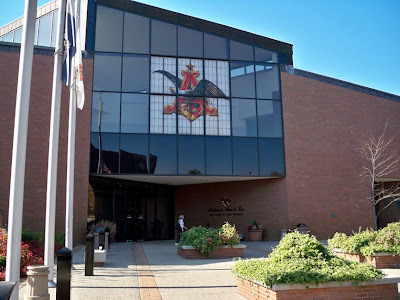 We arrived at the brewery, signed up for the tour, and began making our way around the lobby to check out all the exhibits detailing the history of Anheuser-Busch. Not that much later, our group was called and we were introduced to our two tour guides. One was the Anheuser-Busch equivalent of NBC’s Kenneth Parcell on 30 Rock, so pure and wide-eyed was his devotion to all things Budweiser. The other one reminded me of Scut Farkus from "A Christmas Story," if Scut Farkus thought he was too cool for school and wore clothes mostly from REI. He didn’t even have on any Anheuser-Busch flair, and thus gets a big zero for effort. Kenneth and Scut walked us through the grounds of the brewery, which is about the size of a small city. They showed us the Clydesdales, the big tanks of beer, the mash room and all that. While we were looking at the bottling line, Kelly wondered if they ever pulled a Laverne & Shirley, putting a glove on a bottle and waving goodbye as it’s spirited off. Later in the tour, Kenneth schooled us on Renard the Fox, spokesperson for Bevo, the near beer that Anheuser-Busch sold during prohibition. 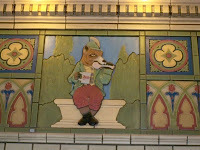 Renard is a very dapper fox that is frequently depicted munching on a chicken leg with a mug of Bevo at the ready. Needless to say, that is one sly fox I want to hang out with. Doubting the rest of our tour group was as interested in Natural Light as me, I caught up to Kenneth in between his spiels, and he was totally willing to answer some questions. First and foremost I wanted to know, “How close am I right this very second to fresh Natural Light?" “About as close as you can get,” Kenneth replied without hesitation. His gusto rivaled that of only Lunch Blog’s friend Dorsett, a man internationally recognized as Natural Light’s #1 enthusiast. Kenneth couldn’t tell me jack squat about Anheuser-Busch’s malt liquor products. When the tour was over, we were led to the hospitality room for our two complimentary beers apiece. I stuck to Budweiser, and Kelly had a Bud Light Golden Wheat followed by a Stella Artois. Meanwhile, our tourmates the Lady Mavs, whose college affiliation and sport was unknown, were settling for sodas. As we enjoyed our beers, we tried to figure out why these girls who were clearly under 21 had chosen to go to a brewery for their Saturday morning entertainment. One suggestion was that maybe they wanted to see the Clydesdales because the Lady Mavs are a polo team, but that theory was quickly discarded. Kelly and I noticed a couple of the Lady Mavs not too inconspicuously grooving on Scut Farkus, although I’m not sure Scut Farkus did. 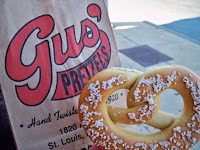 On our way back to the car, we stopped for a snack at Gus’ Pretzels, which I found disappointingly unremarkable. Then it was off to visit the Gateway Arch. Gateway Arch Marketing Team, here is a gimmick for you: As mentioned above, you get free beer at the end of the Anheuser-Busch Brewery tour. When people come down from the top of the Arch, why not give them a free Arch Deluxe? Next Time on Lunch Blog: A couple of nice glasses of wine at dinner. A couple of Gin & Squirts at a dive bar after.